Since 1851, when the Baugo Mission began holding services in a barn, this church has been a part of the Wakarusa community. Through the years, the church moved downtown into the heart of the community. Its buildings grew and changed, and but its message stayed the same—to be witnesses for Christ to the glory of God. The history of the Wakarusa United Methodist Church begins with the circuit riders of the early 1800’s. When the first session of the Indiana Conference was held in 1832, it established a missionary district that included the northern end of the state. Richard S. Robinson was assigned to the post at Elkhart and ministered there and to the surrounding area. The first white settler in what is now Olive Township did not arrive until 1834, so the first Methodist circuit rider was here when the settlers came. 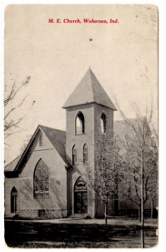 Methodists in town organized in the 1850s and the people of the congregation worked hard to raise the money to build a church through donation and subscription. The church got its first resident minister around this time. The 1940s were a time of changes—Rev. Lawshe was unexpectedly transferred and the pastor who replaced him was soon called to duty as a naval chaplain during the war. After an interim pastor led the church for a few months, Rev. R. Edwin Green and his new bride came to serve in Wakarusa in June of 1944. In the post-war years, Wakarusa Methodist Church participated in the “Crusade for Christ” which sought to raise money for “relief and reconstruction in war-torn lands and mission fields.” The church gave more than $100 over what they were expected to donate. Rev. Phillip Berwick arrived in 1955—and his family had to shuttle back and forth between Wakarusa and his mother’s home near Bristol while the parsonage was repaired. Rev. Art Frisen served here in the late 1950s. The church school (Sunday school) showed growth during the 1950s leading to classes meeting in some unsuitable places such as the kitchen. The bell tower room, unused for years, was pressed into service as a classroom, and the balcony was curtained off from the sanctuary for a class. Youth of the church were very active; projects included a Christmas presentation of the Living Madonnas, erection of the church sign on the front lawn, serving Easter breakfast for the church, and painting a one-half life size Christmas Nativity scene. The youth also were involved in “painting, laying cement, furnishing curtains, giving gifts, and much more” at Bashor Children’s Home. The congregations enjoyed family Sunday night programs, and tower chimes rang out across the entire town during this period. In the 1960s the church had a series of ministers with rather short tenures: Rev. Garth Irey from 1962-1964, Rev. Loren Todd during 1965, and Rev. Reginald Alford from 1967 to 1969. During this time the Women’s Society of Christian Mission was active in collecting items for missions: barrels of clothes for Africa and eyeglasses for India are two mentioned. The group worked with the children of the church collecting money for UNICEF. The meetings often began with a poem and always ended with a prayer. During the 1960s the Women’s Society of Christian Service also helped the younger women of the church start their own circle, with members of this group offering to watch children while the young mothers met together. In 1970, Rev. John Patterson was assigned to the church. The church had decided to go forward with the building of an addition. Sunday morning classes were described as “large” and more room was needed. The building addition with eight classrooms, a nursery, and a pastor’s study was built and dedicated in 1973. Rev. Gene Flickinger arrived in 1976 and with three teenage children in his family, helped to redevelop a youth program at the church. Rev. Doug Anderson arrived in 1978 and expanded upon the youth program in place by taking youth on mission trips out of state, once to New Mexico and once to the East. In 1979 our church started a nursery school in our building which met a growing need in the Wakarusa community. In 1980 the missions committee of the church started grilling and selling Italian sausage sandwiches at local festivals to raise money for missions. We continued to donate clothing and other household goods yearly to Red Bird Mission in Kentucky. Our bell choir was formed at this time with the memorial gift of a set of bells. Rev. Robert Priest served our church from 1984-1989. In 1990, Rev. Ed Geleske, our current pastor, arrived in Wakarusa. A Kid’s Club was organized with 30-45 elementary children attending each week. A new front entrance to the church was added in 1997 which allowed wheel-chair bound worshipers to enter the building at street level. We also installed a small elevator to allow access to the sanctuary above and Fellowship Hall below. The year 2000 the beginning of a men’s group. This group took up the task of hauling donated goods to Red Bird Mission each fall (a project that had been in place since 1997). In 2007 the church took its first mission trip to Thousand Sticks, KY (near Red Bird Mission) in order to experience mission work first hand. Many youth and adults felt called to participate in more hands-on mission work, and we decided to build upon our already existing connection to the church in Thousand Sticks. Since then we have taken a yearly trip (one year we took two separate trips). In 2011 we joined with the two churches in our cluster group and the trip became a cluster trip.